AAA Sports Memorabilia Blog: Which NFL Team With a Bye is Most Likely to Lose in the Playoffs this Week? Which NFL Team With a Bye is Most Likely to Lose in the Playoffs this Week? In the NFL, there is a definite goal during the regular season for the best teams to earn one of the top 2 AFC or NFC seeds in the playoffs. While the other 8 teams had to compete in the wildcard round last weekend, these 4 distinguished teams had the luxury of resting players and gearing up for the final push in the season ahead of the Super Bowl. Those fortunate squads include the league’s most potent offenses and most powerful defenses. In the NFC, the Carolina Panthers and Seattle Seahawks have been terrorizing opponents’ offenses all year. Hard-hitting players like Luke Kuechly, Greg Hardy, Richard Sherman, and Earl Thomas are quickly becoming known as some of the toughest in the entire league. And as the cliché states, “defense wins championships”. Both teams are among the favorites for the Super Bowl. But in the AFC, the two top teams feature the legendary quarterbacks Tom Brady and Peyton Manning, who know how to win and how to score points. Manning led the Denver Broncos and their offense to a record-setting year, while Brady helped the New England Patriots overcome numerous injuries and dismissals to still be among the best teams around. But while the natural thought would be that these teams would steamroll their way to the Championship games next weekend, upsets have become more and more the norm for NFL games. Especially for teams that receive a bye in the playoffs, there can often be a bit of a lull and a lost sense of urgency. Slight rustiness can derail these teams’ hopes very quickly. Additionally, there is the issue of momentum. Some of these wildcard teams have been battling all season long, and have been playing in potential season-ending games for a month. Meanwhile, teams like the Broncos and Seahawks booked their tickets to the playoffs a month ago and haven’t had to play in high intensity matches since November. This can totally catch a favored team off-guard when a hungry and determined team comes into their stadium ready to fight! So which team is most likely to be upset this weekend? The Carolina Panthers. The problem with the Panthers is that they lack playoff experience. While the Broncos, Patriots, and Seahawks all have been in many such high profile games, the Panthers haven’t reached the postseason since 2008. Additionally, this will be quarterback Cam Newton’s first experience in such a game. Newton is an emotional player and has a tendency to overthrow receivers when rattled. While he does have big game experience in winning the BCS National Championship with Auburn, he has yet to face an NFL defense in such a high profile game. The San Francisco 49ers have a defense among the league’s best. With such a young and inexperienced squad, the Panthers are ripe for the picking. The one player who does have playoff experience is the team’s top receiving option, Steve Smith, who is likely to play but could certainly be slowed by a PCL sprain late in the season. With his injury and the youth of the Panthers, I see them facing a severe test in this game. The 49ers were in the Super Bowl last year and certainly can slow down Newton and the Panthers. Additionally, 49ers quarterback Colin Kaepernick is a dynamic playmaker, and running back Frank Gore can certainly push the pile. However, the Panthers did beat the 49ers in a defensive battle earlier in the year, and they clearly have the talent alone to make a Super Bowl run. I think this game is a definite toss-up and may just be the end of a remarkable season for the Panthers. While they are certainly the most likely of the top seeded teams to fall this week, the Carolina Panthers still have a great team and could win this game. 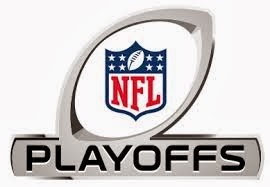 Let’s see what happens this weekend in the NFL Divisional playoff round! AAA Sports Memorabilia has collectibles for all of your favorite NFL teams, including those in the playoffs. We have one of the biggest selections of authentic autographed memorabilia that includes lifetime guarantees. Our products come from the most-trusted companies in the industry. We also carry officially licensed sports collectibles and display case. Visit us often as we add new products daily.